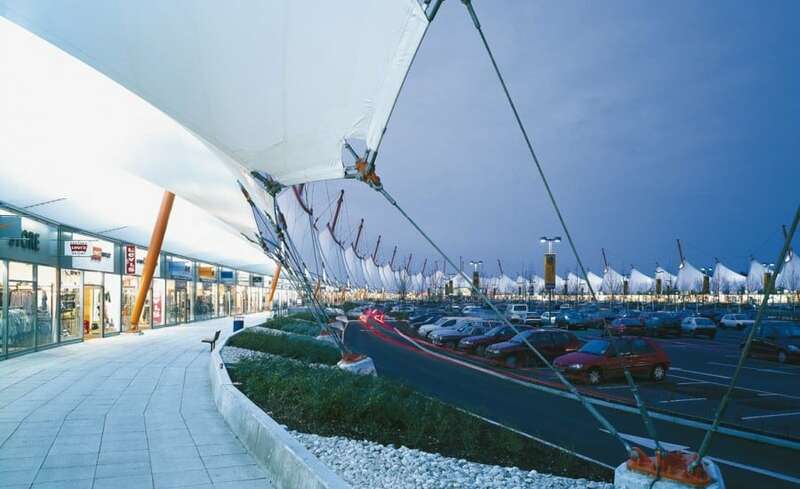 A kilometre long continuous tensile membrane roof of 35,000m2 covering retail units. The PVC Polyester fabric roof, arranged around a horseshoe plan, provides the unifying element in this Richard Rogers Partnership design. Voted RIBA Journal building of the month, April 2000, the membrane roof is an iconic structure. The dramatic impact of the designer outlet village at Ashford is undeniable. 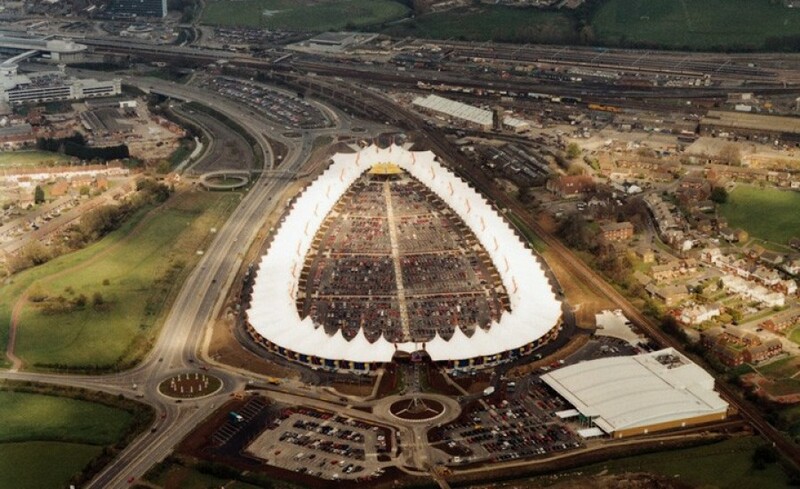 The kilometre long-tented fabric roof is the largest continuous tensile membrane structure in the world, not to mention the most iconic. The architect, Richard Rogers, wanted to create something different, moving away from the conventional shopping experience by creating an outside shopping experience protected from the elements and unlike anything ever constructed. Built on a reclaimed brown-field site, the smooth peaks and bright white fabric are a welcome addition to the rural landscape which inspired them. 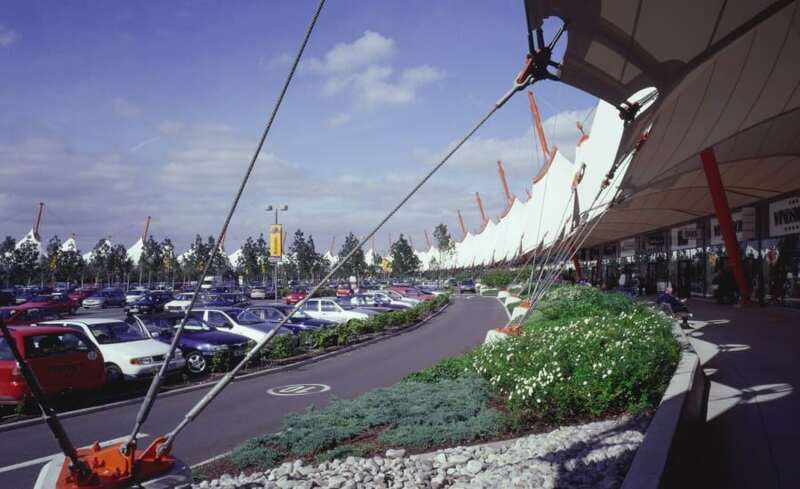 The dyamic shape of the canopies with its bright orange steelwork adds interest to the natural shapes and colours of the surrounding environment. 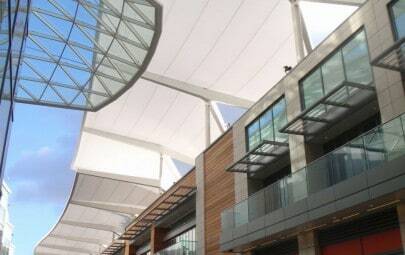 The striking structure has become a landmark for the region, providing shoppers with an exciting shopping and dining experience. 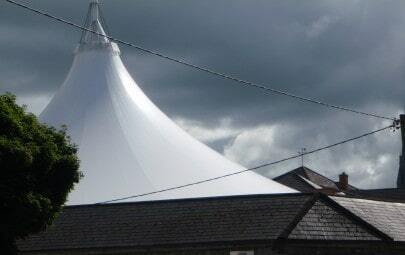 In comparison to other roofing systems, the use of a PVC coated polyester tensile membrane ensured that a large expanse could be covered for minimum cost and allowed the system to be installed quickly. The ridge and valley structure forms the uniting part of this ambitious scheme and allows the outlet centre to stake its place dramatically in its rural setting. The undulating shapes and vertical masts juxtapose with the elongated form of the retail units below. 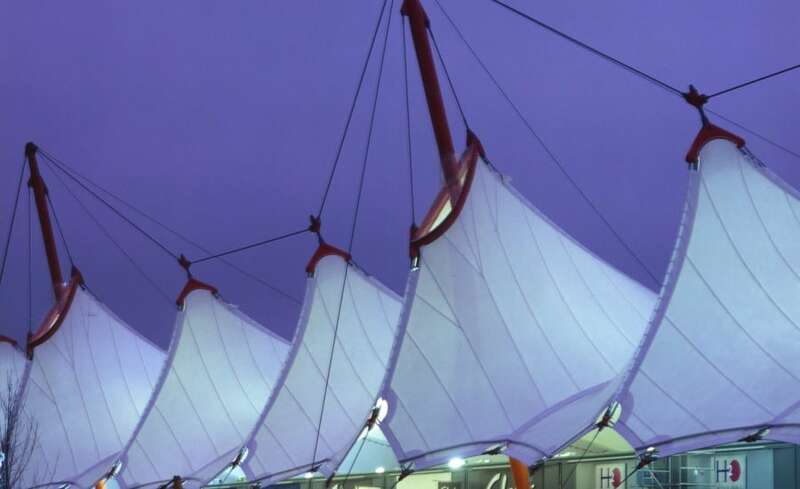 In addition to the continues ‘conic’ style canopy are a series of Inverted Cone structures. The Inverted Cones capture rain and channel it down the steel column and away from the structure. 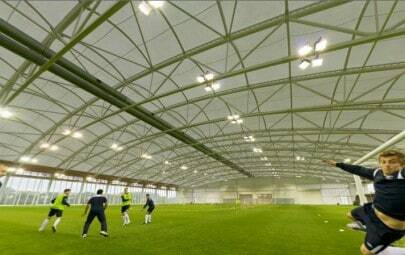 These structures are easy to specify and offer 9m2 (each) of coverage at an economical price. 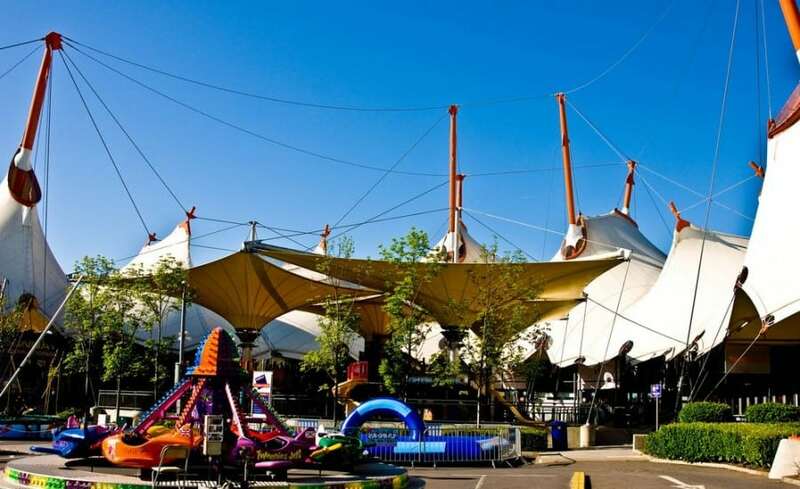 Maintaining one of the largest tensile fabric structures in the UK is no easy task. 35,000 m2 of fabric requires 8 operatives working solid for about a month. A visit includes: specialist cleaning, any repairs, checking fixinngs & fittings, and an inspection report. All of this takes place over a live retail site with minimal disruption. Because our operatives are IRATA Rope Access Trained, there is no place we can’t reach.